Smoky quartz pendant claw set in sterling silver. This fabulous smoky quartz gemstone has rich intense deep brown colour with wonderful warm amber glints inside the stone. The smokey quartz is diamond cut which accentuates the colour and brilliance. The gemstone sits in a sterling silver base with 4 claws holding the gem in place. The smokey quartz stone is open at the back allowing light into the gemstone. 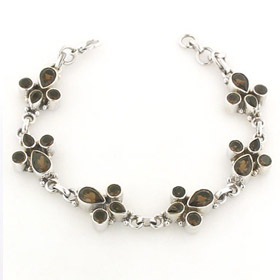 Enjoy free box and UK delivery on all our smoky quartz jewellery. For matching smoky quartz earrings see Cynthia. For the perfect sterling silver chain to wear with this smoky quartz pendant see our collection of Italian sterling silver chains. The chain shown is our fabulous quality and magnificently sparkly diamond cut silver box chain, width 2mm (see below).